How Does Your Body Feel In The Studio? Let’s talk about our muscles and the benefits of massage! As many of you know, I am an artist as well as a Licensed Massage Therapist and I strive to make massage techniques more accessible to makers everywhere. It is beneficial to incorporate massage into your daily routine, and you can do it without leaving the comfort of your own studio. These simple techniques will help you work out knots, increase blood flow and circulation, and get you energized! I recently visited artist Jillian Zoltner Wolf in her studio. Jillian is a fiber artist, so she spends a lot of time at the loom. We discussed some issues that she experiences as a result of her studio practice, and a couple of self-care tools and massage techniques that could be beneficial for her. Weaving can create a lot of strain on the shoulders. I recommend that she uses a “Bonger” to work out the tension in her shoulders. Bongers are a hand-held percussive massage tool that makes it easy to massage yourself and others. This tool increases blood flow and circulation. It can help to alleviate tense muscles, backaches, stress, and more. Jillian’s head juts forward while she weaves, which creates strain on her neck and shoulders. The Hit the Spot neck massager provides an easy way to address this issue. This tool helps massage away knots and relieve headaches. Working with with your hands all day can increase your risk of developing a repetitive strain injury. A Rist Roller is a mini foam roller that helps to elongate muscles and relieve tension in the wrists, forearms, and elbows. 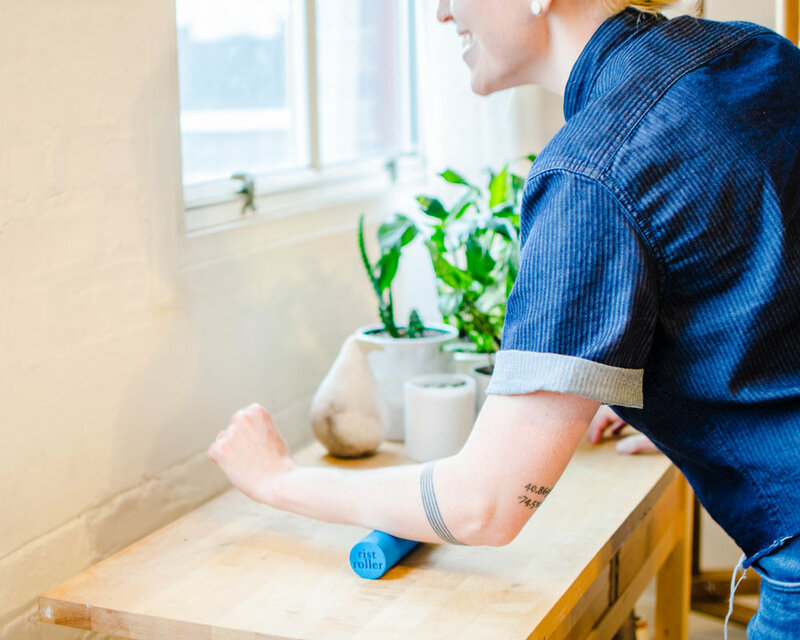 Simply roll back and forth to work out knots and reduce tension in the carpal tunnel and elbow regions. These are just a few ways to incorporate massage into your studio routine without heading to the spa. These tools and techniques will help you work out uncomfortable knots, increase blood flow and circulation, and get you energized! Do you feel inspired to take better care of your hands and body in the studio? I believe you deserve to feel great in your body, so I am excited to share this Free Happy Healthy Hands: Mini-Guide with you! Sign up below to gain instant access!